What Is the Difference Between a Pedigree Chart and a Family Tree? 1 How Do I Heat Pastrami Slices for Sandwiches? An abattoir is another name for a slaughterhouse in the British parlance. Live animals are taken to an abattoir to be killed and dressed for shipment to meat packing plants or standalone butcher's shops, where the larger halves and quarters of the entire animal are broken down into separate cuts of meat for individual sale to the public. Not all abattoirs are the same; some are small businesses with a few employees that process a few hundred animals a week with the use of unpowered hand tools. 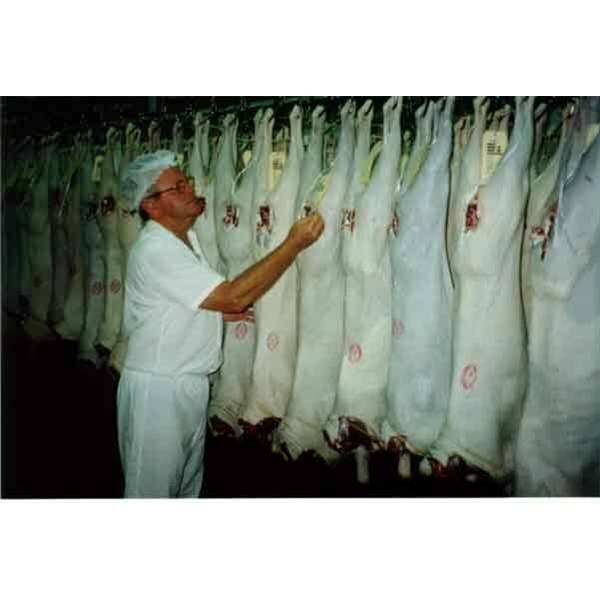 Larger abattoirs may employ in excess of 100 to 200 workers and have an assembly line set up, with each employee doing a specific task on the line. Animals are brought to the abattoir in trucks and are loaded into lairages, which are holding pens for animals waiting slaughter just outside the building. After each load of animals, the lairages must be cleaned of all biological waste to avoid the possibility of meat contamination. The animals are sent one by one through a chute onto the killing floor. Several workers steady the animal while a "knockerman" stuns the animal by shocking it with an electrical gun or using a pneumatic ram to strike it a blow on the skull. Over a hundred years ago, the knockerman was respected for his strength and precision among abattoir workers, using a large sledgehammer instead of a pneumatic ram to the same effect. This is to allow the workers to do their job without fear of the animal kicking or biting, as well as to render the animal insensible and unable to feel pain for a short time. The rear legs of the animal are attached to a set of hooks connected to a motorized rail system suspended from the ceiling, holding the animal off the ground upside down. The animal's throat is then slit while it is held over a catch trough to allow the blood to drain away. The dead animal is then passed through a spray of boiling water to loosen the skin. This allows workers to scrape off the fur and hair of the animal. Subsequently, the animal is skinned. A worker with a gutting knife slits open the animal's belly and removes the internal organs. The digestive tract is categorized as biologically hazardous and must be treated and disposed as such. However the other organs such as the liver, lungs and heart must be removed carefully and kept intact, as they can be sold off separately. From here, the animal's head is cut off, and the carcass is cut in half with a buzz saw down the length of the spine. The halves are placed in refrigerated trucks to be shipped off to meat packing plants of wholesale distributors. An abattoir tries to avoid wasting any parts of the animal as much as possible. To that end, the skins are sold off to tanners for the making of leather. Also, the heads are sold to deli or meat processing organizations, which boil them free of their meat to be made into head cheese. The blood can be sold off to be dried and turned into fish food or high-iron fertilizer. The bones and bone fragments are also sold to be turned into bone meal for plant cultivation.